Yes, you read that correctly. It says white beans. Yes, you’re in the right place. A while back, I was introduced to this recipe by my boss, and fellow vegetarian. I work in a small childcare center where we make several things from scratch. The first day she made these, I was quickly in her office getting the recipe. Granted, this was given to me in the classic southern cooking style, “Well, you add a little bit of this, a dash of that, and then some of those…” Since then, I’ve come up with a workable recipe that I can share here. Soak beans overnight. Drain just before you begin cooking. 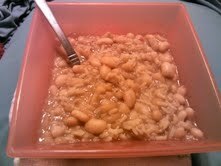 Once beans are done, serve them over rice, topping with salt and pepper to taste. I find this recipe really tasty topped with McCormick’s Bac’n Pieces (which are veg*n and gluten free).